This story is a bit shorter than what I usually write. We had five minutes to write a narrative paragraph in my English class and this sort of just spilled out. I took it home, edited it and made it a bit longer. This is the finished product! I was inspired by some of Egar Allen Poe’s work like, “The Man Who was all used up”, and “Telltale Heart” while writing this. Enjoy! 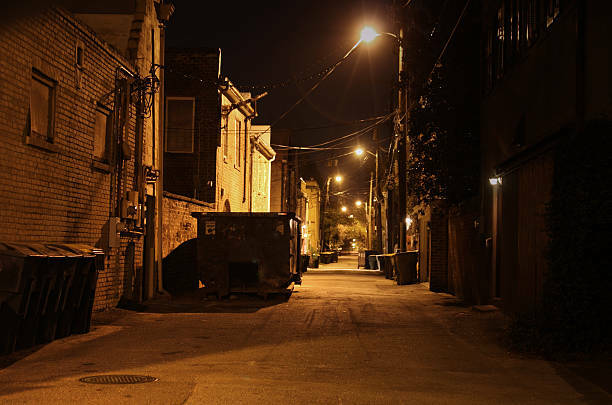 Thomas slinked along a dirty alleyway expertly stalking his victim. He had been following her for what seemed like hours. Slipping in and out of hidey-holes and hidden spots, he ducked behind a dumpster and peered out silently, sneaking a peek at his prize. She was gracefully weaving through cardboard boxes and broken bricks. Her careful movements drew him in. She would take a dozen quick steps, raise her head, look around, and then take a half dozen more steps. Her brown hair shimmered in the yellow light of the street lamps. He lost his composure for just a moment and slipped. His foot rammed into the dumpster making a loud clatter. He froze. Her head snapped up and she glanced around wildly. Thomas caught his breath. He knew that if he made a sound she would dart away into the safety of her home. She was tense, each of her muscles perfectly posed and held tight. He stood completely still, holding his breath. She looked around nervously but eventually relaxed. Thomas released his breath and the tension in his muscles dissolved. He crept forward with such caution his muscles began to ache from the effort. He was so quiet and so smooth, even the most sensitive machine would not have been able to detect his movement. He got so close he could hear her footsteps on the pavement. His insides quivered with anticipation; he could wait no longer. He made the decision in an instant. Thomas leaped out from behind the dumpster and began hot pursuit. He flew through the alley, never taking his eyes off her. His sleek, black coat was streamlined perfectly for the chase. He did not think; instincts took over and guided him expertly. She heard his movement and fled without a second thought. Her reflexes were sharp but not fast enough to escape Thomas’s hungry rage. She let out a yelp of terror as she took her last, frantic steps. An innocent passerby jumped as a black cat jumped viciously out from behind a dumpster and raced after a little brown mouse. The mouse squeaked and tried to escape but the tom-cat pounced and quickly ended her life.